The hedge fund that I used to work at was a small company, personnel-wise. At the time that I left, there were only 40 or so employees between the New York and west coast offices, most of whom, unsurprisingly, were men. For the most part, the guys that I worked with were great, but there was still a good deal of chest-beating and explosive, testosterone-fueled aggression (or straight-up sociopathy, depending on exactly who we’re talking about). Finance is insanely stressful, money makes people crazy, and every guy wants to make it known that he has the biggest d…esk. I get it, but sometimes us poor outnumbered girls just needed a break. So, every few months, the women in the office would head out for a Ladies’ Night. Ladies’ Nights usually involved going out to a nice restaurant, eating good food, gossiping, and drinking way too much. There may have been a call out “sick” or two made the following day–the Irish flu, as my boss liked to call it. And when we weren’t over-imbibing, efforts were being made to keep certain sets of claws in check. (Hey, I never said our gender was perfect.) At the end of it all, though, we could say that we had a good time, just us girls, and the knowing glances the next morning were always worth it. On the last Ladies’ Night that I attended, one of the more low-key occasions, we went to a restaurant in Soho called the Antique Garage. The place is colored of burgundy and wood, the exposed brick walls hung with mirrors, ceiling sparkling with chandeliers. It’s that intriguing combination of opulent and decrepit that only antiques can possess. The menu features Mediterranean and Middle Eastern flavors—olive oil, feta, hummus, olives, oregano and tzatziki. Everything we ate that night was fantastic—rosemary marinated chicken, almond-stuffed apricots—but the thing I remember most was that tzatziki. It was the first time I’d ever tasted the condiment and I left eager to replicate the creamy yogurt and dill combination at home. Lucky for me, it’s an easy thing to make–which is further lucky because it has become a frequently-enjoyed favorite in our home. My version of this classic Greek sauce starts with non-fat plain Greek yogurt. Despite its non-fattiness, this yogurt is still super thick, creamy, and tangy. You could use full-fat if you wanted, but I personally like to make this more of a guilt-free condiment. No compromise on taste, though. 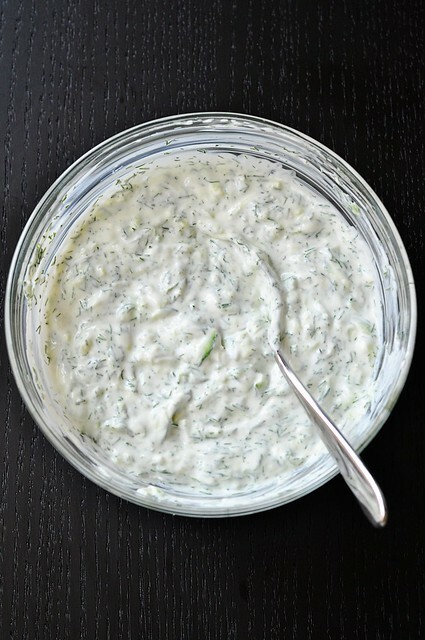 This tzatziki is flavorful, fresh, and delicious on just about anything. 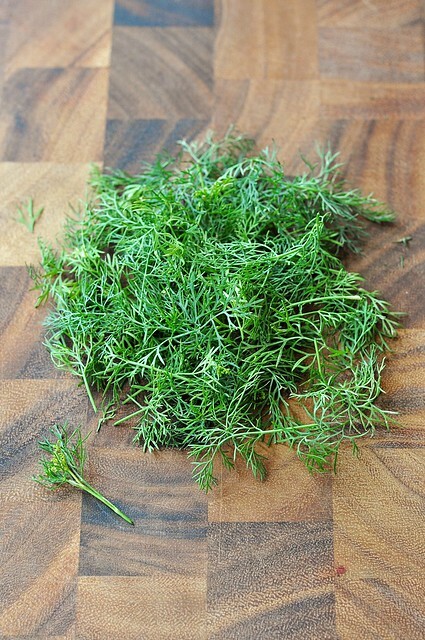 The cucumbers keep it cool, the dill makes it zesty, and that single grated clove gives it a wonderful garlicky punch at the end. Chris and I love to spoon it on top of turkey burgers stuffed with oregano and feta and set atop a bed of quinoa. It’s equally good on beef burgers, as a dip for veggies, or simply stirred into rice. I imagine it would also make a refreshing dressing for potato salad. Or you could serve it alongside some marinated, skewered chicken and rice pilaf, and you’d almost have the meal that I ate the night I first discovered tzatziki. Of course, the fruity cocktails, gossip, and the whole “girls-only” thing would be completely optional. English cucumbers are quite long and usually come wrapped in plastic. 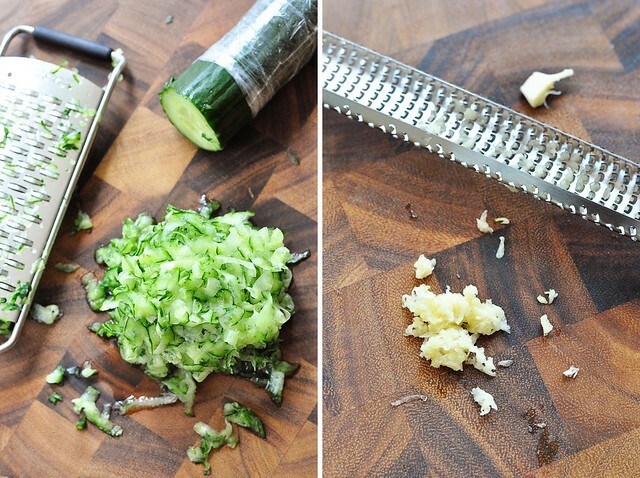 You won’t use the whole thing, so push the plastic wrap just a little more than 6 inches up the cucumber, grate it, and then pull the plastic wrap back down and twist it to seal off the open end of the cuke so you can keep the rest for later. The skins of English cucumbers are thin, so if you can’t find one, be sure to peel the tough skin off your regular cucumber at least partially. Using a clean dishtowel or a double layer of paper towels, gently squeeze out the excess liquid from the grated cucumber. It doesn’t have to be dry, just press out enough of the juice so that it’s no longer dripping wet. 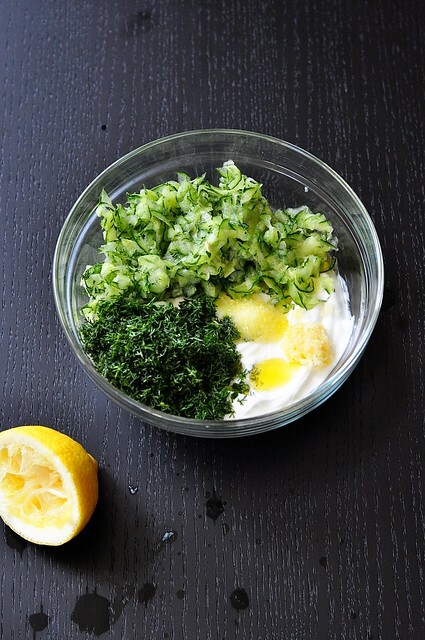 This will help keep the tzatziki thick; if you prefer a thinner sauce, grate the cucumber directly into the yogurt. Put the yogurt in a medium-small bowl. Add the cucumber, dill, garlic, lemon juice, EVOO, and salt. Stir to thoroughly combine. For the best flavor, make several hours or up to a day ahead. Cover and refrigerate for up to a week. hi, i love this recipe. it fits in perfect with my diet. thanks for sharing.